Do you ever go a store and just fall in love with a fabric and just have to have it? Of course you do, all us sewers do, amirite? It’s part of the process, seeing a fabric, loving it and making the garment of our imaginations. I came across this fabric in my local Spotlight recently and just had to have it. I loved the faded red colour, the floral print and the pattern placement. It is a light polished cotton and feels divine to wear. I know the patter looks a little curtain like, but I don’t care! I never seem to bother with the skirt from the pattern so instead this is just a dirndl (gathered rectangle) using twice the full width of the fabric (once for the front, once for the back), gathered and of course with pockets! One of my favourite things about this pattern is that it doesn’t have lots of fancy detailing so the fabric can take be the focus. Again, I left off the neck and armhole facings, I really don’t like facings, and a bias finish is so much easier if you don’t mind seeing a stitching line. This time I used a self-made bias, attaching it so it is visible, basically enclosing the raw edges. I first sewed his to the right side, and then stitched in the ditch to catch in the back. It’s a great dress for meetups too! 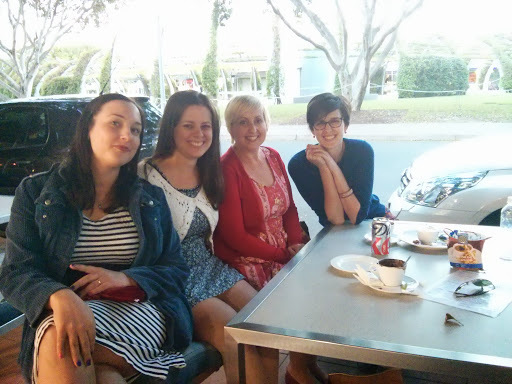 I wore it for a recent afternoon tea with fellow bloggers, Steph (also of Cake Patterns), Rachel and Reana. So now, I am off to play with my new toy! Yep, I bought a cover stitch machine!! I have coveted one of these for ages and now I finally have one, oh the fun things I can make now. I sense a new obsession with stretch fabric in my near future!! Liz, I love it.. the perfect color!!! this pattern looks so good on you.. and your bias binding looks perfect..Happy sewing. Oooh, I can see why you had to have that fabric! Lovely!Congrats on your coverstitch machine! A beautiful dress!!! I love the fabric and your fitting is perfect. Ooo! I love your dress! The fabric, good old S2444, the dirndl skirt and the bias binding. Your dress is much more refined with bias binding. Way to go with the coverstitch machine too. I looked at this same fabric, picked it up and then spoke severely to myself and said "NO". As you know I could clothe Australia so I left this lovely fabric and I am delighted to see that you have sewn up such a gorgeous dress instead. You look lovely in it Liz. Love the fabric, and the dress is very flattering. Bravo!! I love that fabric! I love a fabric that can take centre stage like this with a simple dress design. Beautiful fabric and a lovely dress made out of it! Your meet-up looks like it was fun. And I am in the market for a new sewing machine and am looking at Janomes! Not a cover-stitch machine though, that will be much later on down the line. Love the fabric, it doesn't look curtain like at all. Enjoy your new toy…can't wait to see the results! This fabric is so awesome– I can see why you had to have it! Looks lovely, girl! Your dress is gorgeous! Great find with the fabric! I too prefer binding to floppy facings. You look like a minx!